The London Mathematical Society publishes 12 peer-reviewed journals, 7 of which are in collaboration with other learned societies and institutions. These world-class publications form an important element in the Society's delivery of its strategic activities in support of mathematics and the research community. All surplus income from the LMS publishing programme is used to support mathematicians and mathematics research in the form of research grants, conference grants, prizes, initiatives for early career researchers, and the promotion of mathematics. LMS Members can receive free online access to the Bulletin, Journal, and Proceedings of the LMS, as well as Nonlinearity, on the understanding that they are for the personal use of members, not for libraries. Members can opt to receive this by logging into their LMS Membership Profile, or by sending the annual membership renewal form directly to the London Mathematical Society. The Proceedings of the London Mathematical Society is the flagship journal of the LMS. It publishes articles of the highest quality and significance across a broad range of mathematics. There are no page length restrictions for submitted papers. The Proceedings has its own Editorial Board separate from that of the Journal, Bulletin and Transactions of the London Mathematical Society. The Journal of the London Mathematical Society has been publishing leading research in a broad range of mathematical subject areas since 1926. Articles accepted by the Journal are of high quality and well-written, with a minimum length of 18 pages. The Journal welcomes longer papers (18 pages or more) on subjects of general interest that represent a significant advance in mathematical knowledge, as well as submissions that are deemed to stimulate new interest and research activity. The Journal shares an Editorial Board with the Bulletin and Transactions of the London Mathematical Society. The Bulletin welcomes shorter papers (20 pages or fewer) on subjects of general interest that represent a significant advance in mathematical knowledge, as well as submissions that are deemed to stimulate new interest and research activity. The Transactions of the London Mathematical Society is a fully Open Access journal that publishes leading research in a broad range of mathematical subject areas. Articles accepted by the Transactions are of high quality and well-written. The journal is listed in the DOAJ (Directory of Open Access Journals) and the ESCI (Emerging Sources Citation Index). The Transactions welcomes papers on subjects of general interest that represent a significant advance in mathematical knowledge, as well as submissions that are deemed to stimulate new interest and research activity. The journal is peer-reviewed to the high standard assured by the London Mathematical Society for all its journals. The Transactions is funded by Article Publishing Charges (APCs), payable by the authors with money from their funder or institution. Aside from covering the initial costs of publication, any surplus from the APC goes to the LMS charitable programme to support the mathematics community in the form of research grants, conference grants, prizes, initiatives for early career researchers and the promotion of mathematics. The Journal of Topology was founded in 2008. It is published quarterly with articles published individually online prior to appearing in a printed issue. The following journals are published in partnership with other learned societies and institutions. Managing Editors: Prof. J. Heinloth, Prof. B. Klingler, Prof. E.M. Opdam, Prof. L. Taelman and Prof. E. Vasserot. 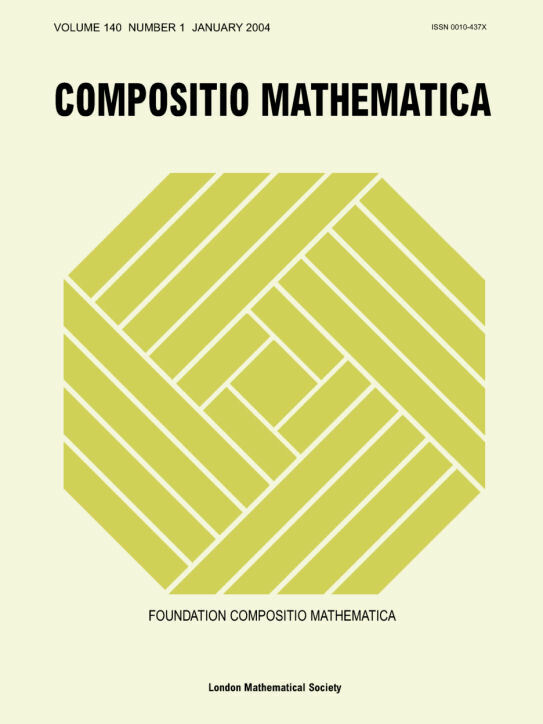 Compositio Mathematica is owned and published by non-profit organisations (the Foundation Compositio Mathematica and the London Mathematical Society) that use any surplus income from journal subscriptions to sponsor mathematics and mathematical research. Submissions can be made via the online form. Read Composito Mathematica articles on the Cambridge Core site. Online access is free for all papers published 5 years ago or more. Papers published before 1997 are available from the NUMDAM website. Mathematika publishes both pure and applied mathematical articles and has done so continuously since its founding by Harold Davenport in the 1950s. The traditional emphasis has been towards the purer side of mathematics but applied mathematics and articles addressing both aspects are equally welcome. The journal is published by the London Mathematical Society, on behalf of its owner University College London, and will continue to publish research papers of the very highest mathematical quality. All surplus income from the LMS publishing programme is used to support the mathematics community in the form of conference grants, research grants, prizes and the promotion of mathematics. The Editors welcome submissions to Mathematika via the submissions web page. Published jointly with the Institute of Physics, Nonlinearity (established 1988) covers the interdisciplinary nature of nonlinear science, featuring topics which range from physics, mathematics and engineering through to biological sciences. The London Mathematical Society co-publishes four translated journals. Russian Mathematical Surveys is the English translation of the Russian bimonthly journal Uspekhi Matematicheskikh Nauk, founded in 1936. The survey articles on current trends in mathematics are generally written by leading experts in the field at the request of the Editorial Board. The Russian original is rigorously refereed within the Russian Academy of Sciences and the translations are carefully scrutinised and edited by the London Mathematical Society. Until the end of 1997, Russian Mathematical Surveys was published jointly by the London Mathematical Society and the British Library. Since 1998, Russian Mathematical Surveys has been published jointly by the London Mathematical Society, Turpion Ltd, and the Russian Academy of Sciences. The English language version is a cover-to-cover translation of all the material, containing survey articles, the Communications of the Moscow Mathematical Society, and biographical material. Izvestiya: Mathematics is the English edition of the Russian bimonthly journal Izvestiya Rossiiskoi Akademii Nauk, Seriya Matematicheskaya, founded in 1937. The journal publishes only original research papers containing full results in the author's field of study. Since the beginning of 1995, Izvestiya: Mathematics has been published jointly by the London Mathematical Society, Turpion Ltd, and the Russian Academy of Sciences. Sbornik: Mathematics is the English edition of the Russian monthly journal Matematicheskii Sbornik. This is the oldest Russian mathematical journal — in publication since 1866. The journal publishes research papers keeping pace with modern trends in contemporary mathematics. Sbornik: Mathematics has always maintained the highest scientific levels in a wide area of mathematics, with special attention to current development in Mathematical Analysis, Ordinary Differential Equations, Partial Differential Equations, Mathematical Physics, Geometry, Algebra and Functional Analysis. It is designed for researchers in these domains of mathematics and related sciences. Since the beginning of 1995, Sbornik: Mathematics has been published jointly by the London Mathematical Society, Turpion Ltd, and the Russian Academy of Sciences. Sbornik: Mathematics is published bimonthly, each issue being made up of two issues of Matematicheskii Sbornik translated into English. The LMS Journal of Computation and Mathematics was a free online journal that published internationally-leading papers addressing topics in computational pure and applied mathematics, including papers at the interface of Mathematics and Computer Science. The journal was closed to new submissions in October 2015 and the final volume was published in 2017. Since 2010, the journal has been hosted online by Cambridge University Press, including the archive dating back to 1998. The London Mathematical Society is committed to maintaining this archive of published papers into the indefinite future. Details of the former Editorial Board can be found here. All papers published 1998-2017 can be accessed via Cambridge Core for free.